Send Single and Bulk SMS Messaging to all states of Malaysia!! Send single and bulk SMS with 1s2u to all states of Malaysia with a simple, effective, and practical online platform. Our services is licensed by Malaysian Communication and Multimedia Commission (MCMC) to give you the best experiences you need. Use the power of our online platform to manage all your SMS messaging. Whether you want to schedule your sent SMS, have a two-way SMS communication, make message templates, or auto-responding messages, all these are easy and possible with our services. According to statistics, SMS messaging has 94% open rate by users, which considered as the best gateway to make your advertisments and annoucements. Feel free to use our services, and contact us at any time. Our support team is available 24/7 to ensure the utmost satisfaction is delivered to you. Start messaging and claim your free credits and account now! 2. Whatsapp: You can Whatsapp us using the following number "+1 (213) 221-3751"
4. WeChat: You can WeChat using "sms1s2u"
1. HTTP API: Integrate our HTTP API tool to be used in your custom designed system. HTTP API allows you to get a gateway for bulk SMS messaging, or to become a bulk SMS provider. Read more. 2. 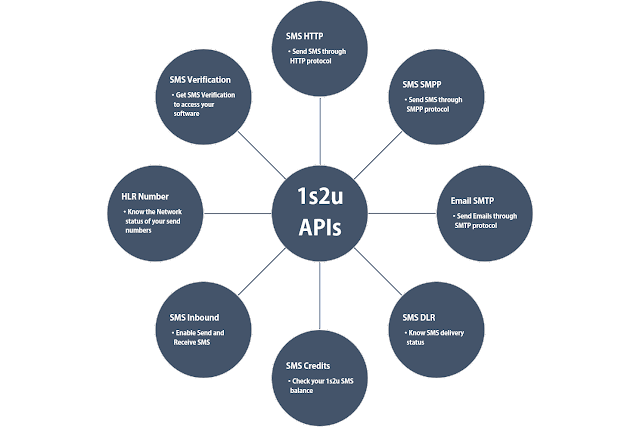 SMPP API: Short Message Peer-to-Peer (SMPP) is an open, industry standard protocol designed to provide a flexible data communications interface. Get your SMPP Bulk SMS Gateway with the SMPP API, or become Bulk SMS Provider. Read more. 3. SMTP API: Simple Mail Transfer Protocol (SMTP) is a standard protocol for sending emails. We provide you with SMTP API to be used and integrated into your customized system. Read more. 4. DLR API: Get full, accurate, and detailed reporting (DLR) for all messages sent status. Upon integrating the DLR API, you will know the status of your sent messages. Read more. MCMC:Malaysian Communications and Multimedia Commission is a Malaysian Legal authority in communications and multimedia industry. Comodo Secure: is a well-known American Cyber Security company to ensure the protection of systems and data even from military grade threats. Trust Guard:is a well-known security and business verification company to give the trust to customers about company's activities. PCI DSS: PCI Data Security Standards is a security standardization to ensure continuous assessments and standardizations are set for the security of data. Trust Lock: is a well-known security and business verification company to give the trust to customers about company's activities. We are happy to announce 1s2u.com is officially licensed by MCMC, a legal authority in Multimedia Communications in Malaysia. 1s2u.com is authorized by the Malaysian government to be used for sending and receiving Bulk SMS Messaging. Send your Bulk SMS Messaging with confidence, and make your first steps for success!! How 1s2u Bulk SMS Messaging Works? In order to know how 1s2u.com works, it is important to have a summarized introduction first. 1s2u.com is one of the biggest leading quality SMS services company in the world! With experiences of nearly 20 years, 1s2u.com is always committed to providing professional and quality SMS services. 1s2u.com is distinguished from other providers with its low-cost and flat rate concepts, and human real-time one-to-one communication for 24/7. Read more here and here. 1s2u.com applies simple and practical solutions to its customers, and it is open for any suggestions for improvement, and you are welcome to be our reseller for our services. We will provide you with all the necessary training and guide you step by step to have your own customized SMS services company. Read more here. SMS Automation makes your customers have frequent automated updates about your latest news and products. Choose your list of contacts, and link it to your update channel to set your automated SMS messaging.